UFO PAGE True stories (hopefully). I will now only update these pages as and when I receive accounts, so please keep on sending them in. To start off this interactive feature. I have given each account a case No.or Name just click on the case below Slow Light : UFO'S? :Cape Cod : Strange Light :Alien Contact :Distant Light : Stange Object? : Vapour Trail? Strange Happenings? : Golden Objects : UFO over Swansea :Engine cutout. SLOW LIGHT The following are accounts that I have received over the last month. These cases are what I call unknown lights etc, these are very hard to pin to the type of sighting that they really belong to. One night, a few years ago, I used to teach night classes at a local Jr. College. As I was driving home, around 9:20pm a looked into the north sky and I saw this silver , very round, light. It did not look like an airplane, the light did not have an halo,it was very bright, it was not a flood light, because it did not have the usual cone which goes from the equipment to the light. Here is a account sent in by Carlin. It doesnt move, it`s black, and it`s over there about a half hour. It`s no cirkel, it`s not round, I don`t no what it is!!!! I cant take pictures, because I don`t have my camera. It`s no ballon, no airplane, I think it`s an U.F.O. !!! Now here is a very interesting sighting from Kevin. I was fishing with my godson Josh late one night around 2:00AM, it wasnt any special night that I recall, until we saw the what i'd call some kind of craft. Josh got my attention by almost falling onto the rocks we were fishing off. He told me to "Look Up", as I did I saw a cigar shaped light blurb above us around a half mile up. I was speechless, as was Josh. It all of a sudden seemed to have smaller lights spinning around it, and a strange aura as well. I was in a trance, not from the craft or anything like that, just from seeing this happening in front of my own eyes. Josh Kind of got me back to earth so to speak by slaping my arm, and saying " Do you smell that" I did smell somthing odd, ozone I guess, electrical, somthing. The whole thing lasted like 6 minutes all together. All of a sudden there was a flash and it was gone. Josh and I got the hell out of there in a hurry. I've only talked about my experience a few times, but to a select few... Maybe you've heard of a similer situation? If you have could you drop me an e-mail, i'd be thankful if you did. I not some crackpot abducty , I just want to know for the sake of knowing. Martin sent me this account of his experience. Last night 23/08/99, I took the dog out for her nightly ablutions, the time was about 2220, the stars were clearly visible the Moon had a light high cloud haze . As I stood there waiting I looked up the field towards the Pennines and Lyme Park about five miles as the crow flies. My attention was caught by a bright light, that from my angle of view at first seemed only marginally higher than the roofs of the houses that are at the end of the field. At first I didn't pay allot of attention, we are not to far off the Manchester Airport Flight path and Woodford aerodrome is only three miles away. It soon became apparent however that the light wasn't getting any closer and it was extraordinarily low for a Manchester bound plane and in any case I could hear no sound, this aroused my curiosity, the more I looked the less it looked like an aircraft, it seemed to be stationary and I could not see any beams of light only an intense brightness. I continued observing hoping I'd be joined by another dog walker, I wasn't. It wasn't a helicopter, no noise and the speed was faster than any aircraft that I have witnessed, (I spent six years in the Royal Navy, with many hours on the bridge at night, and have witnessed supersonic jets and helicopters in all conditions). I called our local paper today to enquire weather any one else had reported anything similar. Martin sent me a bit more on the above. This next account was sent to me, I have attached a photo that Jenna sent in. Hi im Jenna from west sussex crawley, which is supposed to be the key place for paranormal experiences according to many famous scientists. I my self am very psychic, as my grandmother was and it has been passed down to me. What i am about to explain to you is to do with dreams! this is a huge fascination and has baffled many people from the beginning of time. some people think its a load of rubbish that you see bits of the future or how they can mean some thing or that you may leave your body etc... but who knows, what ever its very exciting and to me that's all that matters. I have been having many weird dreams linked to aliens for a long time even though i don't even think about the , but the most weird thing is me and my mum both have the same dreams and even my grandmother who is now passed! had the same dream too. This in its self is very strange, maybe we are all being told some thing, or maybe we were being abducted whilst in a trance like state of sleep and then brain washed and didn't even know it. One of my dreams was of me being scanned by a kind of alien ship, it looked like a tv screen or some thing i cant really explain it but ti was scanning my head, like to get information, very slowly and it was tremendously pain full. I remember feeling scared and trying to get away thinking they were horrible but this voice from nowhere really comforting told me it would all be all right and would soon be over, and just told me to keep still then it would be over more quickly. So the aim of what they were doing was obviously for information or god knows what but not for illumination. any way as it scanned slowly down my head the pain was awful and the voice told me not to move but my neck went into spasm with the pain so my neck jolted and the scan started again over the same place, i thought it would never end. When it was all over i remember looking in the mirror where i jolted and saw a huge cut across my neck covered by a plaster like strip but was barely noticeable and well camouflaged i could only by the ends slightly. This next account is sort but to the point. Well I was in Tenerife on my holidays when a little flat line was going through the air of course I thought it was an airplane but it was going at a slow speed then it turned around and in a tremendous burst of speed and flew at about 10 times as fast. I then sent another email to the above person for more information, this is the reply. My name is Tony Curry and I was out on Sunday, driving home from Ilkley moors to Silsdon, we were passing a lake to our left (the time was about 4.30PM, begining to become dusk)when a bright fire appeared to our left, I slowed down the car for a better look. There was a dark object with a very long fiery tail which must have cover a quarter of the sky, I would say it was about 1000 ft high and about half a mile away. It shot accross the sky and just before it reach the right hand side of us the fiery tail went out just leaving the dark object mass traveling along, it then dissappeared over the moors. I phoned the local airport, who would not give me no information and the local police who did the same. I had my family in the car who all witness this event. This is something that happen a few weeks ago. On one of the few sunny days we have had in July, my son was just taking videos of vapour trails in the sky and zooming in to get a picture of the planes, well after about the fifth vapour trail my son took a video of a vapour trail at 16 times zoom, when he notice that there was no airplane in front of the vapour trail as in the others he had took. Here is the picture below, I let you make up your own mind, you have my word of honour that this picture has not been altered in any way. This picture is copyright 2000 by Anthony Ritchie. The following was entered into my guestbook sometime in Feb 2001. I had a experience with a being, who was bluish, with large eyes. My great aunt was an abductee, her cattle was mutilated, she was visited by men in black who shot at her, she by the way worked at Nasa during a period of time, in Los Almnos. These beings followed her from Arkansas to New Mexico then onto Texas. There is a large crater size indention in the earth behind her home,(she is now deceased)in Hondo Texas, the indians will tell you what the star people are about....my experience has been a blessing and overwhelming...I did not like being frozen in my shoes and seeing my brother and sister in suspended animation, with a being that has the power to immobilise you terrifies me.. This was sent in by a Mr Harrington. Hello- My son and I saw something extremely bizarre today and I felt the need to tell someone!? We were playing baseball in the back yard around 12:30 PM and saw three round golden objects traveling at a high speed and fairly low in the sky - we watched them for a few seconds and then they just vanished. My son is almost four --he saw them first and pointed them out to me. I have never seen anything like that before. Do people ever report sightings in the daytime? I live in Delphi Falls, NY - 20 miles south east of Syracuse. Please give me a shout back with your thoughts if you have time. THANK YOU. This was sent in by Matthew Minty . Hi, my name is Matthew Minty and I live in Swansea in South Wales and a few years ago I saw a cigar shaped object hovering over the bay at about 8 o' clock in the evening and loads of people saw the object , it just suddenly disappeared into thin air. It was on the front page of the local newspaper the next day and when I read about it, it said that loads of people had been phoning up the airport to find out what it was but no-one knew. Then, about ten o' clock, a black helicopter turned up at the air port and two men got out in black suits and tried to convince traffic contol that it was a weather balloon and nothing more! Then they got back into the helicopter and flew off never to be seen again! Don't worry, I didn't make it up because I am know exactly the same things as you! If you want e-mail me my address is below. I have lots of other stories from around where I live and I have no-one to talk to about them because my friends all think I'm mad . This was sent in by Stan Watson. I would like to report what I can only describe as a strange experience on Friday the 20th of June 2003.........at 4.56pm. I live in North East England.....Newcastle upon Tyne. I was returning home from shopping in my car, when I noticed a silver shaped object very high in the sky on a very clear sunny day.....with little cloud. At first I thought it must surely be a plane.....yet it appeaed to have no wings whatsoever. I pulled up at traffic lights along with at least 5 other cars my eyes transfixed on the object above....well above normal airoplane height. I honked my horne and pointed to the sky......as the craft slowly made its way across the sky I must have been looking at the object some 45 seconds to one minute. The traffic lights changed to green yet all cars refused to move.....all engines having cut out. As I looked into the sky the object was again clearly visable with no cloud in the vicinity. 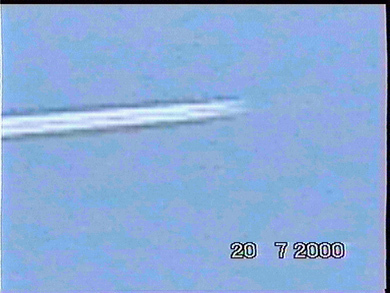 Yet within a slit second the entire craft just disappeared into thin air.....with no explanation!! After the craft disappeared.....our engines started up once again as if by magic.....it really was weird!!! This is only the second time in my life that I have witnessed this kind of sighting......but have never reported such experiences until now. I can tell you however that having seen many programmes on tv about UFO's......I have a very open mind.....especially after hearing of many other peoples experiences. Meanwhile, the area where I live there are many other sightings which have been reported......as having been strange. We have an airport at Newcastle and when sightings were reported over an area.....the Airport Staff sometimes admit to having no aircraft in the area at the time. So whats going on? Meanwhile, many thanks for your very interesting website. Will keep in touch with events. Sincerely. Stan Watson Newcastle upon Tyne England.